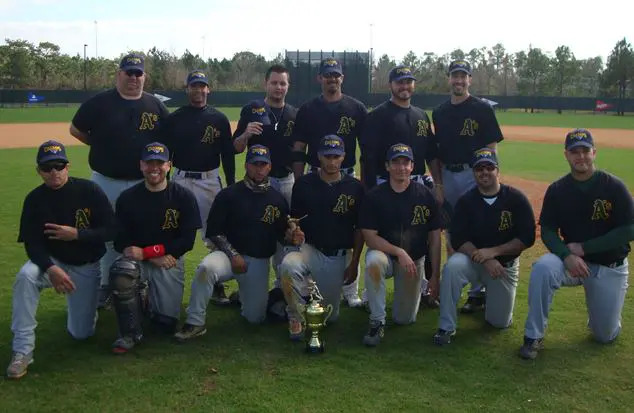 Kissimmee, Fla. – Once upon a time the Coral Gables A’s showed up to as tournament and called themselves “the bridesmaids,” according to head coach Miguel Garcia. That’s what watching the other guys win will do to a team. So when the A’s took a five-run lead into the bottom of the fifth inning in the finals of the MSBL’s Holiday Classic at Disney, and then watched it collapse to just one run, the specter of the bridesmaid began to hover. Albert Jardines and Jared Bahnsen wanted no part of it. Jardines, who finished 3-for-5 with a run scored and six RBI, had key run-scoring singles in the seventh and ninth innings. Meanwhile, Bahnsen held the New York All Stars in check during the final four innings to capture a second 18-over Holiday Classic championship in three years. The Disney championship, played at the ESPN Wide World of Sports Complex, the spring training home of the Atlanta Braves, comes on the heels of a Fall Classic title at Roger Dean Stadium in Jupiter , Fla., in November. It helped the Athletics shed the bridesmaid label and capped a 4-1 week and helped exact a measure of revenge against the same New York team that handed it a 6-2 loss during round-robin play. The tournament was held over the Martin Luther King weekend. New York entered the title game following an unbeaten round-robin effort that afforded it a playoff bye. Early on, it appeared the extra day off may have been a detriment. The Athletics got to New York starter Garrett Rogers for a pair of two-out runs in the second, a run in the third and two more in the fifth for a 5-0 lead. Bahnsen meanwhile, was cruising, until Taylor Eggleston’s fifth-inning double helped ignite a four-run outburst that got the All-Stars back into the game. Eggleston scored on a Jose Garcia single, while Laz Piniero’s single later scored Rogers to cap the inning. From there however, Bahnsen was nearly unhittable and what had been a game-changer in tournaments past, was quickly forgotten when the Athletics, just as they’d done in a semifinal playoff victory over the Tainos Indians, scored late to put the game away. The Athletics scored three runs in the seventh and then added four insurance runs in the ninth to put away any hopes of a New York comeback. Jardines’ big hits scored three of those runs. Tournament MVPs Alvaro Gomez (nine runs scored, 636 OBP, .385 batting average) and Max Rios (team-leading nine hits, three triples, .474 batting average) were key contributors, each finishing 1-for-3 with a pair of runs scored. Against Tainos, Melvin Mancebo pitched a four-hitter, striking out 11 in a 5-3 come-from-behind victory that wasn’t assured until the Athletics scored a trio of eighth-inning runs to overcome a 3-2 deficit. It was a harbinger of things to come for Coral Gables in the title game and Garcia hopes for the foreseeable future. WP – Jared Bahnsen (1-0); LP – Garrett Rogers (0-1). Hitting – (CG) Jardines 3-5, R, 6 RBI; Martinez 1-1, 3 R, 2 SB; Hassell 2B, 3 R, 2 SB. (NY) Eggleston 2B, R; Garcia 1-3, RBI; Piniero 1-3, RBI.